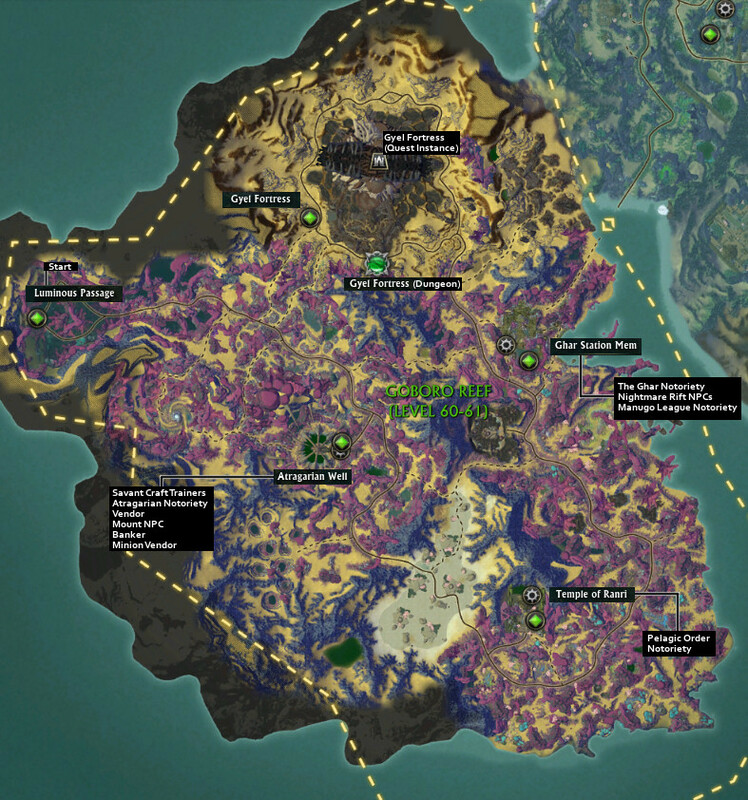 Here’s a collection of Nightmare Tide maps with porticulum information as well as other major points of interest such as where you’ll find Savant Crafting Trainers, the main weeklies and dailies as well as raid/dungeon locations. Tip: For map locations, type /setwaypoint x y into your chat replacing x and y with map co-ordinates. i.e. for Chorebug’s crafting area that is located at (5882, 5551) you type /setwaypoint 5882 5551 into chat and it will mark the location on the map for you. Interested in knowing all the locations for each Nightmare Tide daily that gives Notoriety? Check them out here in RiftGrate’s Guide: Nightmare Tide Notoriety. Atragarian Well has Savant Craft Trainers, Atragarian notoriety vendor, Mount vendor and Minion vendor. Templre of Ranri has Pelagic Order notoriety vendor. Ghar Station Mem has The Ghar notoriety vendor, Manugo League Goods vendor, Nightmare Rift NPCs that can take you to the Shores of Terror Instance as well as the Manugo Stations. Flargle Plaza north of Margle Palace has all PvE and PvP weeklies, Marks of Notoriety turn-in and most vendors including the various notoriety vendors all in one location (excl. Atragarian notoriety vendor). Margle Palace has bankers, auctioneers, class trainers, dye, clothing, guild, marriage and minion vendors inside the palace and its surrounding areas. This is also the new 3.0 city hub. Choreburg has Savant Craft Trainers and Crafting Dailies/Weeklies at (5882, 5551). Ghar Station Rosh has Nightmare Rift NPCs, Manugo Station and The Ghar notoriety. 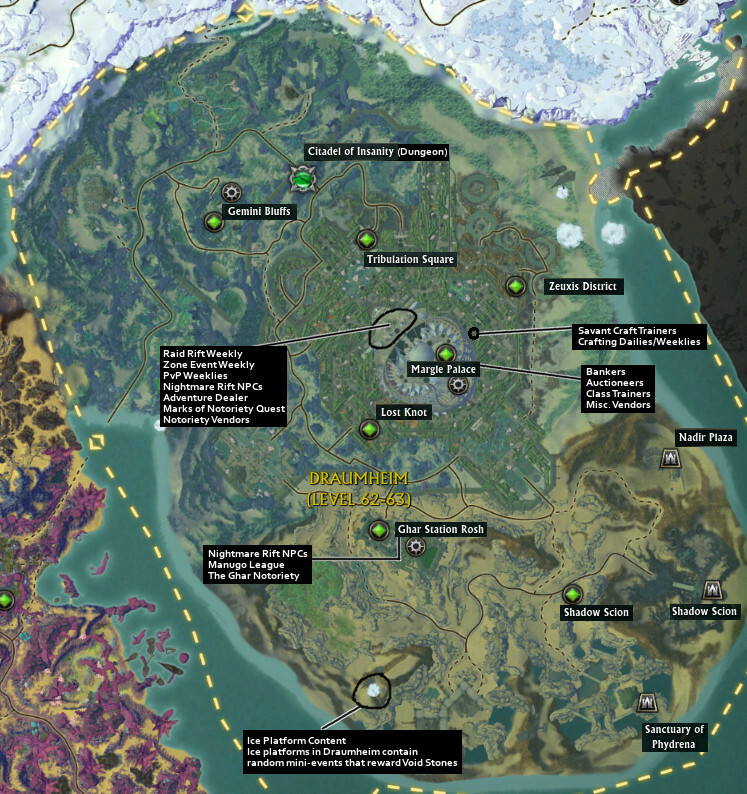 Ice Platforms (the white circles on the map) contain a random assortment of activities that give you Void Stones. Tip: Since you can swim in the ‘ocean sky’ above Draumheim unimpeded, you can swim to each porticulum’s location and ‘drop down’ to get to them and save their location by speaking to the Porticulum Master. You can then return to the ‘ocean sky’ by running over the Sea Sponge that is next to each Porticulum. Ghar Station Tau has Nightmare Rift NPCs, Ghar notoriety vendor and Manugo Stations. Port Scuddra has Cerulean Rhenke notoriety vendor. Occus Monastery has Pelagic Order notoriety vendor. The Rhen of Fate Tier 1 10-man Raid is located south-west of Port Scuddra at (6362, 4228). 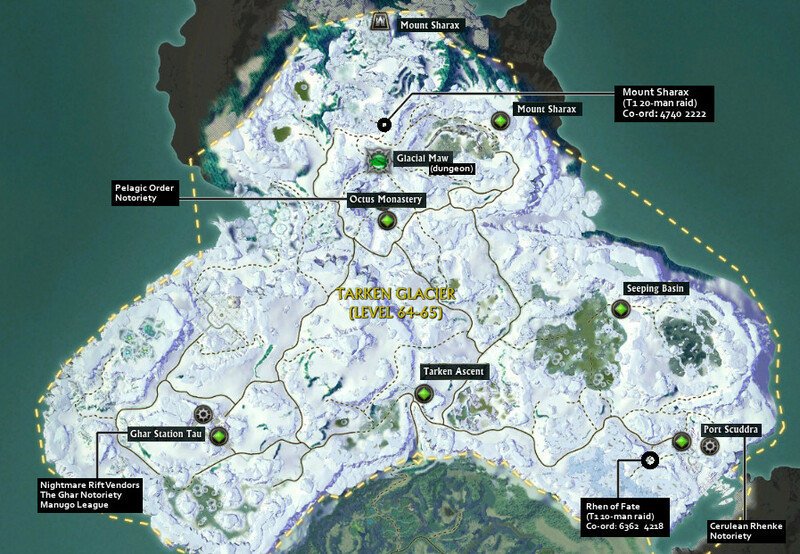 Mount Sharax Tier 1 20-man Raid is located at the base of Mount Sharax at (4740, 2222). Hope these maps prove useful and all the best in Nightmare Tide!